Dave Garner and Kev Lee can do no wrong at the moment in the Fenland Rods matches. This week the pair were at it again when the club fished the Cedar Pool on the Decoy Lakes complex. Top rod was Lee with 200lb from peg 22 - all caught close in on cat meat - while Garner put 130lb 2oz to the scales. Third was John Garner with 111lb 5oz followed by Neil Garner on 105lb 9oz. Club treasurer Ray Torrington took the honours in the Deeping St James club’s Les Wiles Cup match at Kingsland with 96lb 11oz. Second was new match secretary Mike Smith with 72lb 5oz and in third place was John Bowland with 62lb 8oz. 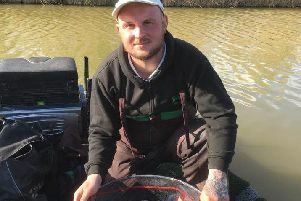 The Webb’s Match Group were at Buttonhole Fishery at Wisbech at the weekend and clear winner with 124lb 12oz was Mick Humphries. He fished the long pole with pellet over to the island. Ray Gregory came in second with 81lb 1oz followed by Alan Forrest with 65lb 5oz.